Candy Crowley has become unexpectedly unavailable. 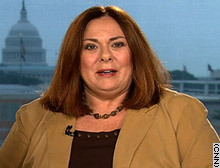 Immediately following the October 3rd presidential debacle debate, CNN advised President Obama, as well as some guy scheduled to debate him about foreign policy on October 16th, that Candy Crowley needed an immediate and lengthy period of convalescent leave commencing immediately and extending at least through mid January. Hence, she will be unavailable as debate moderator. Having left for Syria early on the morning of October 4th, Ms. Crowley could not be reached for comment due to the communications and other difficulties currently being experienced there. Despite this unexpected development, prominent PBS news anchor Big Bird flew promptly into the breach and offered to moderate the debate in her place. He did so despite an avalanche of appearance requests from the most principled of all media. “Saturday Night Live,” Jimmy Fallon, Piers Morgan, the “Today” show and “Good Morning America” have all asked for appearances from the giant yellow Muppet after he was unexpectedly thrust into the presidential campaign by Mitt Romney on Wednesday. 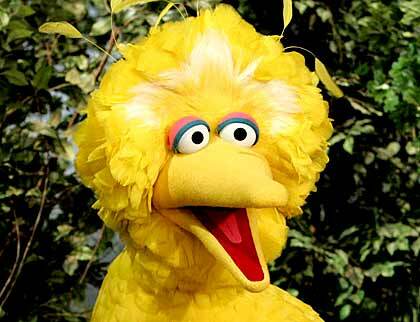 Sesame Workshop says Big Bird is declining all appearances. His kind offer to moderate the debate, and hence his need to prepare for it, explains this unusual display of modesty in declining all such requests. Promising to be neutral as between our Best President Ever and that other guy who wants him fired just so that he can take his job away from him too, Big Bird explained that death threats mean no more to him than President Obama’s generous and greatly appreciated offers, made for the sake of the Children, to increase funding for his program. He also made it perfectly clear that his promptness in reporting for duty was not intended to preempt Governor Palin’s anticipated offer to moderate the debate solely, as she was thought likely to say, in the interest of promoting gender equality and helping to end the Democrat war on women. Big Bird stated that although women obviously have their proper places — in Planned Parenthood clinics, in feminist studies programs, with the Democrat National Committee, in the U.S. military and elsewhere, they are ill suited to moderating rough and tumble presidential debates. CNN had initially considered offering celebrated moderate Paul Krugman the debate moderatorship but, realizing that Big Bird would be seen as even less partisan, was delighted to accept his gracious offer instead. Although Ms. Crowley’s unexpected unavailability might seem a bit sad to some because none of the three presidential debates this year will be moderated by an actual woman, Big Bird explained that he can also speak in a high trilling twitter and is often considered flighty. Hence, his substitution for Ms. Crowley should be hardly noticeable. He also explained that, like Ms. Crowley, he has no fixed ideas on foreign policy beyond thinking that all places, domestic and foreign, must be for the birds and thus follow President Obama’s brave leadership in that direction. He promised to repress any prejudices uninformed Republicans may erroneously think he has in favor of President Obama, even though the other guy has repeatedly used the phrase “chicken manure,” or a more vulgar equivalent, to disparage President Obama’s heroic, decisive and historic actions on behalf of our country. He promised to overlook that and other evidence of the other guy’s mental imbalance, as well as his repeated assertions that President Obama’s foreign policies must have flown out of a cuckoo’s nest. Big Bird stated that he disagrees with those and other vile anti-avian mischaracterizations but that, even were they accurate, it would not affect his moderation; some of his best friends (many of them President Obama’s friends as well) are cuckoos and chickens. We can all look forward to another great Presidential debate in which President Obama demolishes the absurd foreign policy notions expressed by that other guy, who was found and offered an opportunity to comment but declined to do so. He quickly moved out of camera range (obviously to the right) just before this photo was taken. His purposeful evasions notwithstanding, his ideas could only have come from such a source. 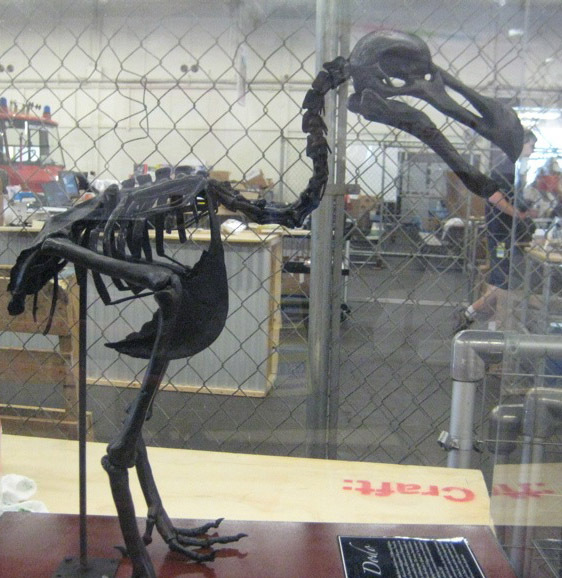 Dodo bird, previously thought extinct. In a startling development of which I had not been aware, Big Bird in September challenged Mrs. Obama on pushing “her husband’s socialist health care agenda” as well as to produce his U.S. birth certificate. He may, after all, be reasonably impartial. This entry was posted in Big Bird, Candy Crowley, CNN, Democracy, Democrats, Dep't of Information, Elections, Fairness, Free Press, Governor Romney, Humor, Insanity, Media, Media-morphing, Obama, Palin, Paul Krugman, Politics, presidential, Presidential Debates, Romney, Satire, Snark, United States, Voting, War on women, White House and tagged candy crowley, libya, pbs news anchor, politics, promoting gender equality. Bookmark the permalink. You made my morning bright and cheery with these posts; just 30 more days until we have the great privilege to vote out our Beloved Chief Teleprompter and help him make history before he drives us off the fiscal cliff. Many thanks. I enjoyed writing it. Now, although I don’t want to, it time to revert for a while to more serious stuff. What implications, if any, does yesterday’s election in Venezuela augur for the elections next month in the United States? Nothing, I hope, but . . . .
Would it not be fairer to let the poor old President have a TelePrompTer? Why, of course it would. Denying him that presidential necessity is like depriving Governor Romney of a hairbrush before the debate*. Were Governor Romney to appear with unkempt hair, it would be nearly as bad as President Obama appearing with an unkempt mind without his beloved TOTUS. * It is possible that I am prejudiced because I am nearly bald.